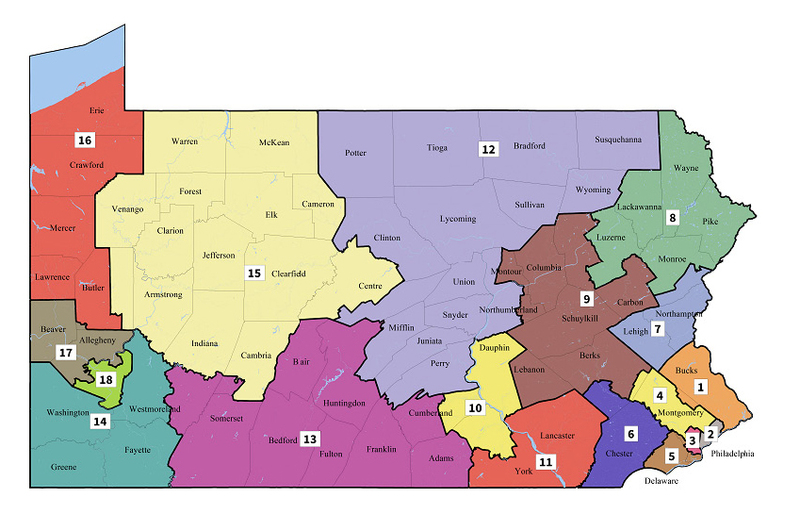 The Pennsylvania Supreme Court released the Remedial United States Congressional District maps resulting from the gerrymandering suit brought by several groups, including Fair Districts PA. These maps only impact the United States House of Representative seats, and they do not influence the Pennsylvania House or Senate races. The new maps will be in effect for the 2018 Election. Upper St. Clair is still part of the very different 18th Congressional District. The 18th includes much of downtown Pittsburgh, south east Allegheny county, and Upper St. Clair. Mt Lebanon is not part of our district, as it is now part of the 14th. Starting January 2019, our U.S. House Representative will be Mike Doyle if he wins his unopposed General Election this November. Congressman Doyle will appear on the ballot in November. If you are not familiar with Mr. Doyle, please take some time to check out his website. After his Special Election victory, Conor Lamb will represent Upper St. Clair for the reminder of 2018. Congressman Lamb is running in the redrawn 17th District which includes his home in Mt. Lebanon. Hi, I’m Congressman Mike Doyle and I will be running in the upcoming May Primary to represent you next year in the new 18th Congressional District. Our new District includes communities in the South Hills, the Mon-Valley, the Eastern Suburbs and the City of Pittsburgh. By way of introduction, I have lived in this district all of my life, I ran a small business here, and my wife and I raised our children here. I care very deeply about the Pittsburgh region and the people who live here. In Congress, I have worked to promote policies that provide all Americans with a decent education, affordable health care, a dignified retirement, a clean environment, an improved standard of living and real opportunities for people to achieve their personal and career goals. For the remainder of this year, you will be capably represented by Conor Lamb, who I was proud to support. I look forward to meeting and representing the people of Upper St. Clair in the next session of Congress. In the past year, I’ve been honored to travel the Commonwealth of Pennsylvania on behalf of Fair Districts PA (https://www.fairdistrictspa.com) to discuss how legislators have “gerrymandered”– or, altered the boundaries and electoral makeup of Pennsylvania’s Congressional Districts to influence voter turnout for partisan gain – the electoral process. FDPA is a coalition of citizens and organizations who believe that in an American democracy, elections should represent the will of all the people, not just the politicians, and should provide citizens with meaningful choices in electing representatives. The 14th District formerly comprised of the City of Pittsburgh and immediate suburbs will now be comprised of Greene, Fayette, Washington & parts of Westmoreland counties. The eastward section of Westmoreland County will shift into the 9th District. 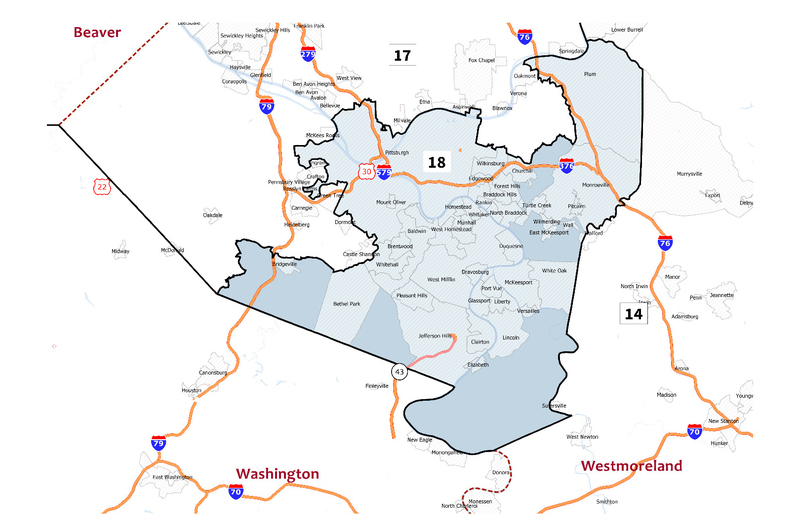 There is no incumbent in the 14th District, which covers most of the boundaries formerly in the “old” 18th District, but four Democrats (Bibi Boerio, Tom Prigg, Adam Sedlock and Dr. Bob Solomon) and two Republicans (Guy Reschenthaler and our old friend Rick Saccone) have thrown their respective hats in the ring. This district is heavily rural and conservative. Most of the “old” 14th District will be transformed into the “new” 18th District – but, will also now include some southern Allegheny County suburbs including Upper St. Clair. The incumbent for our new district is Mike Doyle (D), who is running unopposed until the General Election where he will face Janis Brooks (R). This is a safe D District. Mt. Lebanon and other (southern) suburbs will now be shuttled into the “new” 17th District. The incumbent there is Keith Rothfus (R) and Democrats Conor Lamb and Ray Linsenmayer will be facing off in the primary on May 15. This is a highly competitive District. To make matters even more interesting, Pennsylvania is expected to lose a Congressional seat (down from the current 18) in the wake of the 2020 Census – and, chances are good, due to population decline and attendant variables, that SW PA will again be in the eye of the electoral storm. So, the map for Congressional Districts will, once more, need to be redrawn in time for the 2021/22 election cycles. Will Upper St. Clair voters be moved into yet another District via the reapportionment process? Get your popcorn heated and stay tuned. Mr. Misra, with master’s degrees in Public Policy and Political Management from American University, Washington, D.C., is a professor in the Department of Social Sciences & Education at the Community College of Allegheny County and lives in the18th District. His seminars focus on voter behavior with respect to redistricting in PA. He is also the founder of Development Worx LLC, a consulting firm serving the education, government and non-profit sectors.